As interesting as that is, the following T-Square (Grand Cross if you add the asteroid Hygeia) is particularly interesting. 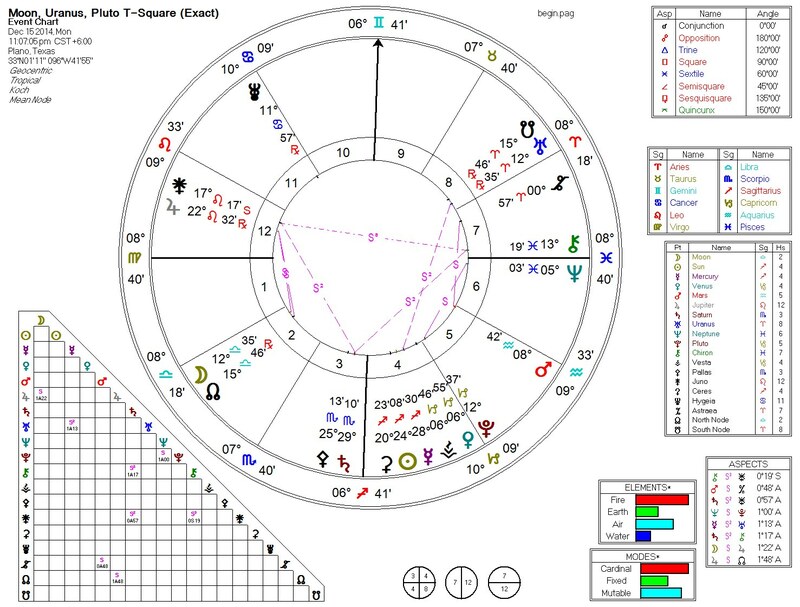 We believe that any significant events that occur during this period will occur near this alignment of the Moon into the Uranus / Pluto square. If violence can be avoided, this is a strong period for creativity (5th harmonic) and resolving old grievances (karma, 7th harmonic). Juno (trust issues) and Chiron (the wounded healer) are connected by a TriSeptile; both in turn connect by BiSeptiles to Saturn (hard work, tests, trials, and tribulations). We have not seen any discussion of a pattern like this, but almost certainly it involves working through old wounds that resulted from violations of trust. (We will name it a “Septile T” because it corresponds to a T-Square.) Septiles (and biseptiles and triseptiles) are thought to be karmic and indicate that something “must” be done (or some form of deterioration will occur). This particular pattern may involve, among other things, the trust that the public does, or does not, have regarding the police forces (and vice versa). We note that this follows a period of particularly intense Thor’s Hammers. So, whatever happens here might actually be the culmination of the series of events associated with those. And, to some degree, the results we have here are consequent to choices made earlier in August and September during the Grand Yod. As potent as this Uranus/Pluto square is, we believe that it is the Septiles (and Quintiles) that will dramatically color how this powerful and unstable potential is expressed at this time. Issues of trust and healing must be resolved.